هتل چاونگ بلو لاگون سامویی یکی از هتل های 4 ستاره سامویی می باشد که دقیقا در ساحل چاونگ واقع شده است. اتاق های هتل چاونگ بلو لاگون سامویی همگی داری بالکن اختصاصی یا تراس هستند و خدمات رفاهی کاملی در آنها برای میهمانان تعبیه شده است که برای اطلاع از آنها می توانید به انتهای همین صفحه مراجعه نمایید. هتل چاونگ بلو لاگون سامویی دارای امکانات متعددی از قبیل استخر، باشگاه، ماساژ و انواع تفریحات و ورزش ها آبی می باشد. برای آگاهی از تمامی امکانات و خدمات هتل چاونگ بلو لاگون می توانید به انتهای همین صفحه مراجعه کنید و موارد را که به صورت مجزا ذکر شده اند را مطالعه نمایید. رستوران هتل چاونگ بلو لاگون سامویی نیز در کنار استخر واقع شده است و با سرو انواع غذاهای سنتی تایلند و همچنین غذاهای بین المللی در خدمت پذیرایی از میهمانان هتل می باشد. در کنار ساحل نیز بار هتل واقع شده است که می توانید برای میل کردن نوشیدنی های متنوع و خنک به آن مراجعه کنید. هتل چاونگ بلو لاگون سامویی دارای موقعیت مکانی خوبی است و با 5 دقیقه پیاده روی می توانید به مرکز چاونگ تشریف ببرید و از مراکز مختلف خرید و تفریحی و طبیعی آن دیدن کنید. بر اساس نظرسنجی های انجام شده به واسطه نظرات مسافران در مورد هتل چاونگ بلو لاگون سامویی، این هتل امتیاز 8.3 از 10 را برای سفرهای دو نفره کسب کرده است. هتل چاونگ بلو لاگون سامویی را به صورت آنلاین رزرو کنید! 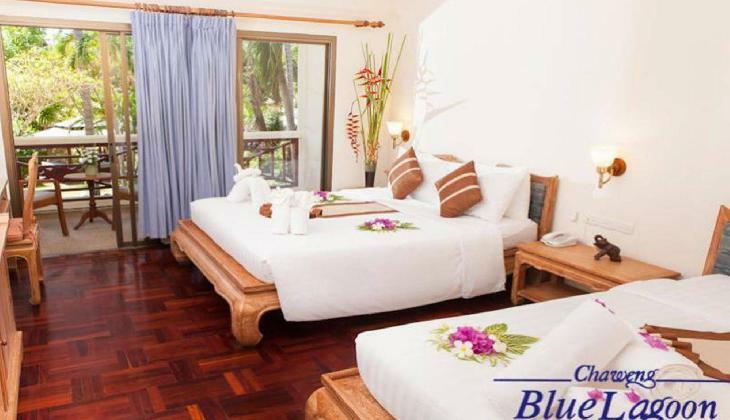 * Blue Lagoon Resort at Ko Samui is spacious and has a total of 70 rooms. The rooms are comfortable and are well furnished. 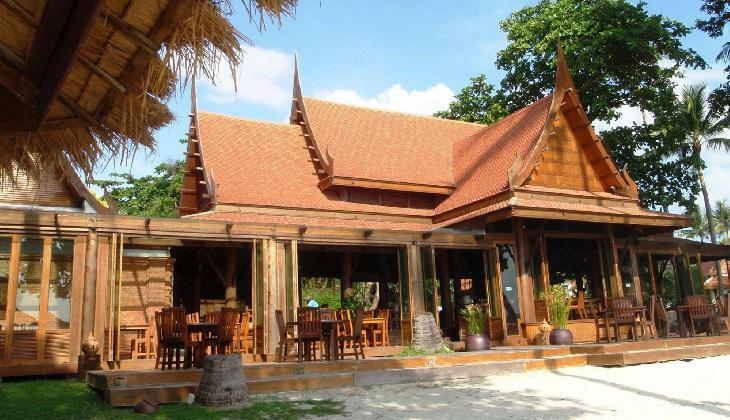 The hotel boasts of its wide range of accommodation. Designed to provide ultimate comfort and luxury the hotel offers ample room facilities. 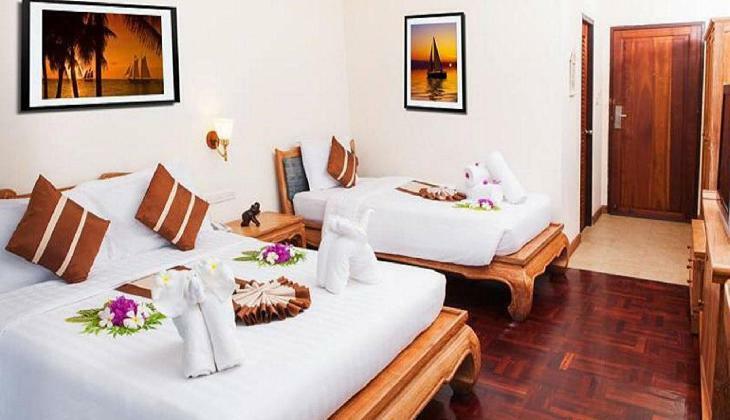 The Room Facilities at Chaweng Blue Lagoon Resort at Ko Samui include air conditioning, mini bar, telephone, desk, tea or coffee maker, private safe, terrace and hair dryer. 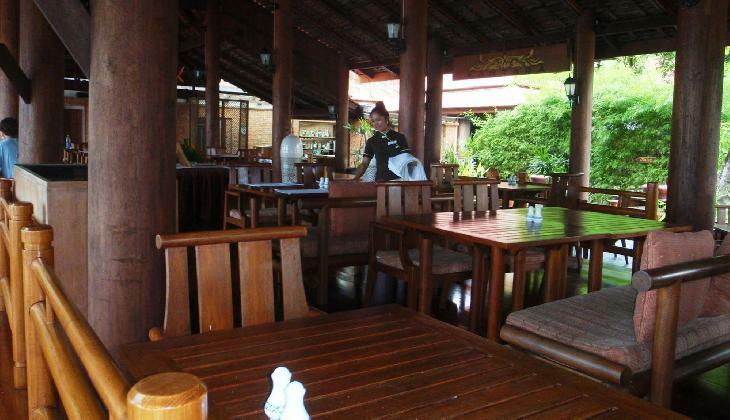 * Blue Lagoon Resort in Ko Samui offers "Kantara Restaurant" which serves standard delicious cuisine for the guests. 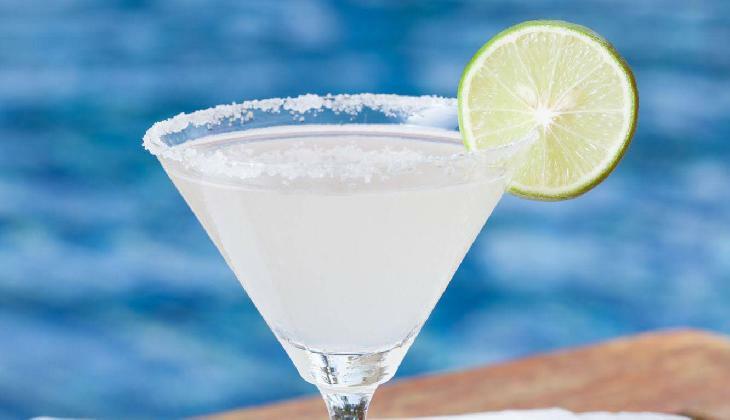 * The Beach Bar offers tasty and refreshing snacks and drinks all through the day. It is the perfect place to chill out. The Pool Bar also features in the hotel. In the restaurants you can indulge in bakery stuffs including breads, croissants, pastries and the like. * A fitness corner is provided to the guests. You can also go for swimming in the outdoor swimming pool. For relaxation you can also try the Jacuzzi section. 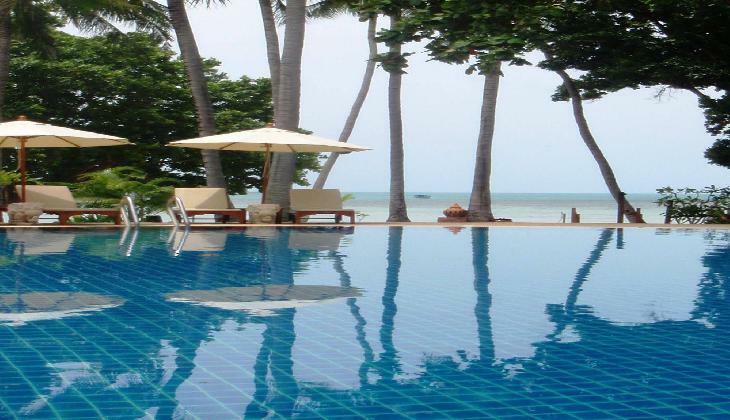 The Blue Lagoon Resort of Ko Samui also provides provision for water sports. * Besides all these the hotel has much more to offer. 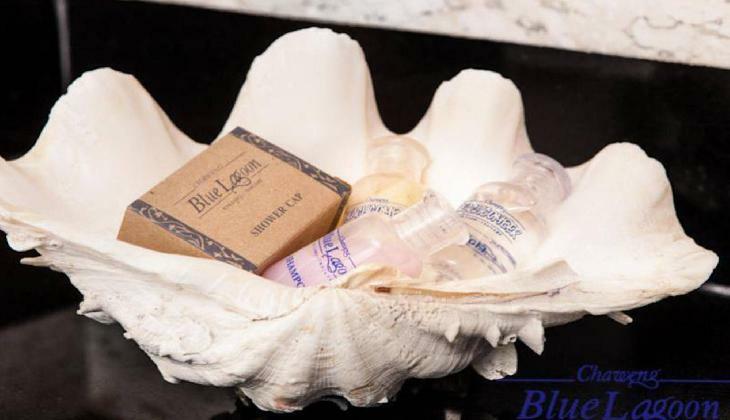 The Hotel Amenities and Services at Blue Lagoon resort in Ko Samui includes Thai Massage, air port pick up and drop off, morning call, city transfers, dry cleaning and laundry, room service, nursery, car rental, cocktail lounge, baby sitting, 24 hour reception, library, money exchange and fax. 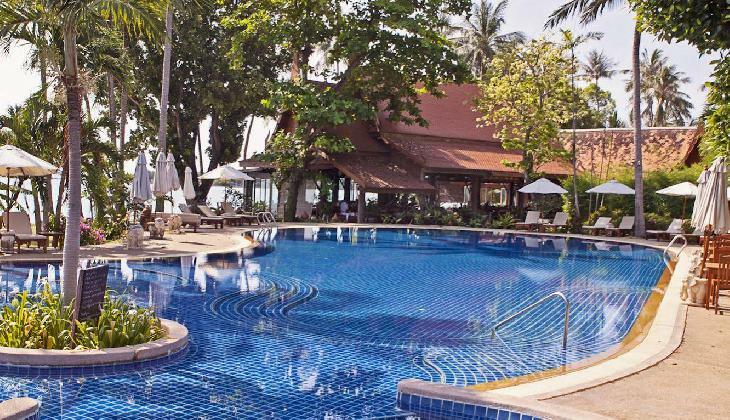 Blue Lagoon Resort occupies a first-class beachfront location on the northern, quiet section of Chaweng Beach, Koh Samui. 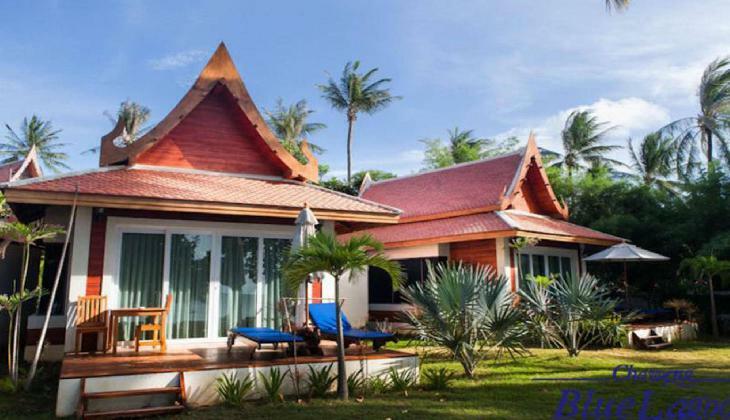 Styled like a Thai village, Blue Lagoon offers 71 cottages, all with air conditioning and private balconies in the middle of a lush tropical garden on Koh Samui, the coconut capital of the world. 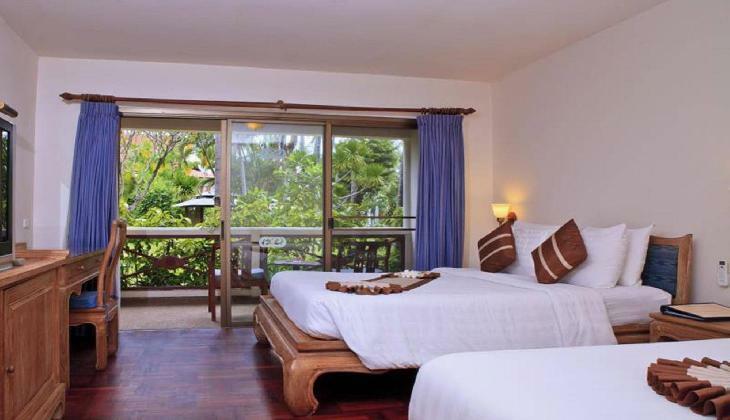 The superior rooms with teakwood furniture, all have a balcony or terrace and are equipped with a single and double bed. 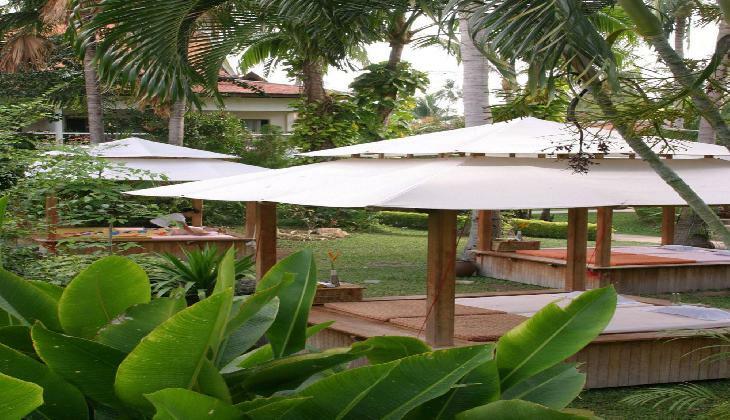 This oceanfront resort, surrounded by impressive gardens, has been designed for those seeking relaxation. 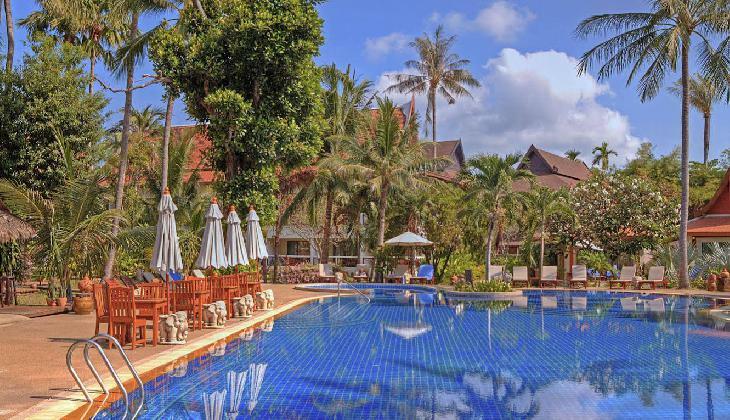 A freshwater swimming pool with free sun-lounges and umbrellas, a jacuzzi, a pool for children and a playground inside lush tropical gardens, are all part of facilities to make your holiday a relaxing success. 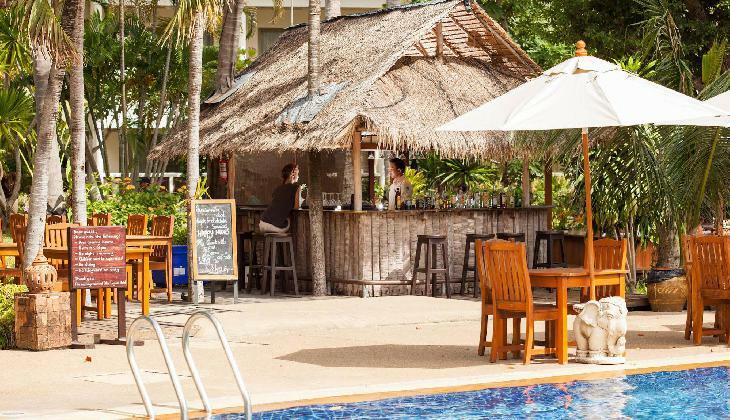 The Location of Blue Lagoon Resort in Ko Samui is on the beachfront of the northern tranquil section of Chaweng Beach in the largest island of Thailand called Koh Samui. 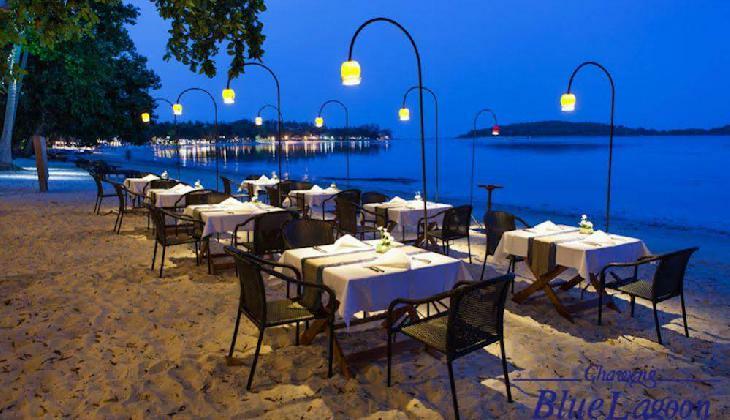 The Location of Blue Lagoon Resort in Ko Samui is favorite among the visitors as it is very close to the shopping centers, entertainment venues and night life. 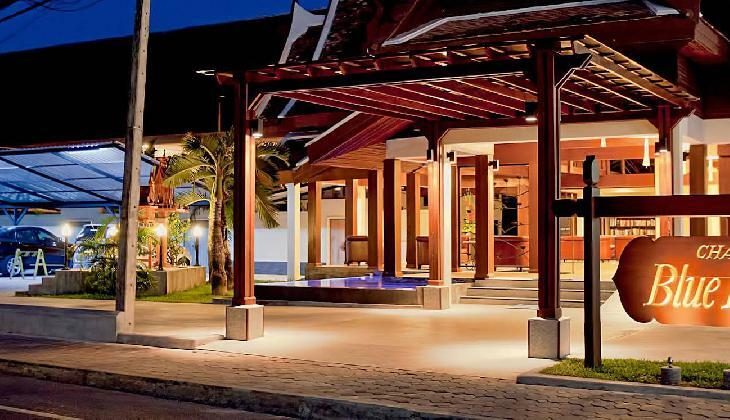 This first class modern hotel can be conveniently accessed from the Samui Airport which is only 3 kilometers away. An important landmark near the hotel includes a hospital and a buffalo fighting stadium. This luxurious oceanfront resort is only 1 kilometers away from the city center and very close to the impressive and spectacular beach. 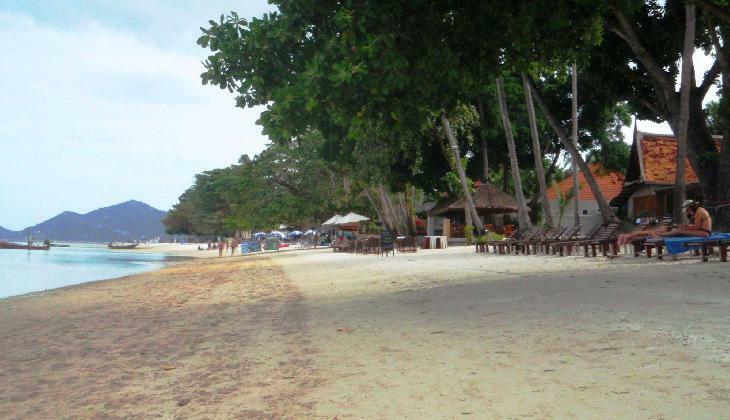 You can spend a quality time wandering along the beach. Koh Samui Airport being only 3 kilometers away it takes hardly 10 to 15 minutes by car to reach the airport. 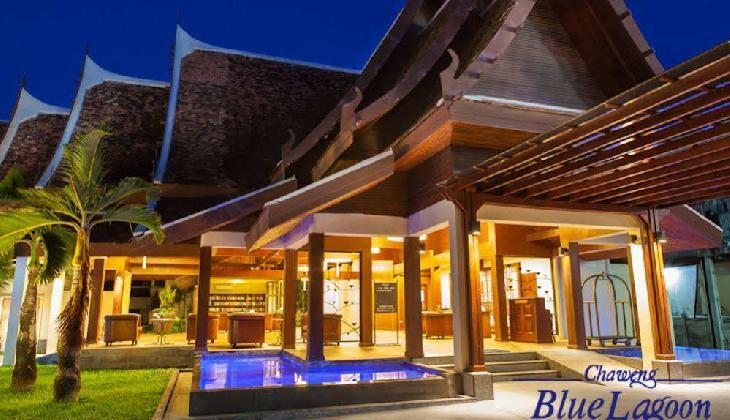 This resort can be easily accessed from all major destinations.